A variagated sea urchin (Lytechinus variagatus) displaying clipped spines and tube feet in a test for regenerative properties. 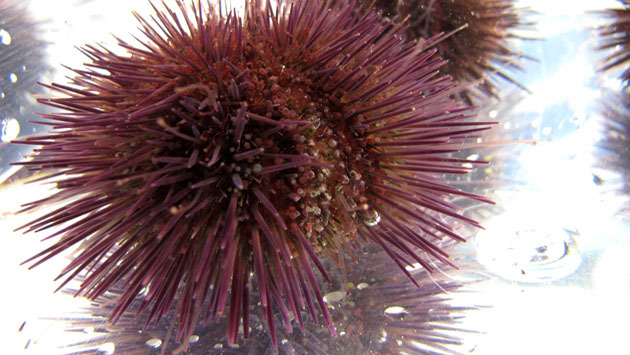 With a novel regeneration assay, the Molecular Discovery Laboratory found that regenerative ability in sea urchins does not decline with age. 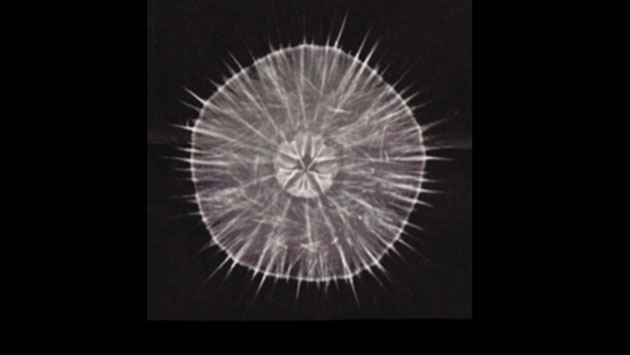 X-ray image of adult variegated sea urchin, Lytechinus variegatus. Sea urchins, along with sea stars and sand dollars, are echinoderms. Echinoderms are closely related to vertebrates and share many of our cellular processes. Sea urchins provided scientists of the late 19th century the first opportunities to watch a naturally transparent embryo develop from a single fertilized egg. 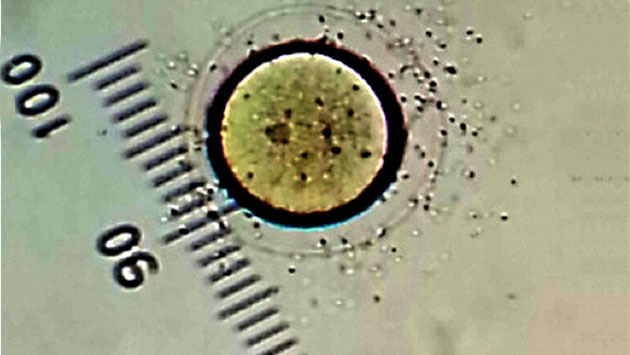 In this photo, sperm cells are clustered around the membrane of a recently fertilized egg from the variegated sea urchin (Lytechinus variegatus). Ten graticule units indicate 100 µm. Photo by Derek Schwenkmeyer, REU Intern, 2013. Heat maps showing age-related changes in gene expression in sea urchin (S. purpuratus) tissues. The sea urchin approach to gene regulation may reveal effective strategies for preventing degenerative decline in humans with age. The Molecular Discovery Lab at BIOS employs the tools of molecular biology to advance our understanding of the cellular mechanisms underlying different life history traits of marine animals, and how they respond to environmental stressors. Current research in the lab uses sea urchins to investigate the biological underpinnings of tissue regeneration, longevity and resistance to age-related diseases such as cancer. In addition to being a model animal for understanding fundamental biological processes, sea urchins are keystone species in the marine environment and also a significant fisheries resource in many areas. Their responses to a changing climate and pollutants in the sea can tell us how the ecosystem as a whole might be vulnerable to environmental stressors. Data showing that longer-lived species have a greater capacity for tissue regeneration and repair, with the longest-lived species possessing a unique ability to mitigate cellular oxidative damage. 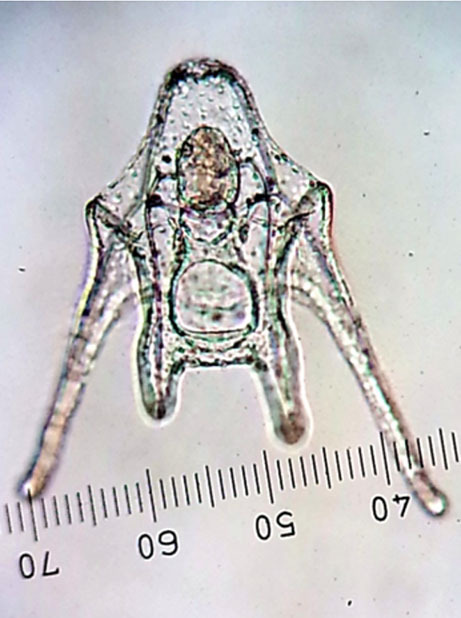 Three days post-fertilization, the sea urchin embryo has developed into a pluteus larva with a mouth and gut. The ability to view larval development made sea urchins ideal model organisms for parsing out the pathways of developmental biology to understand how genes orchestrate cell growth and differentiation. Ten graticule units indicate 100 µm. Photo by Derek Schwenkmeyer, REU Intern, 2013. Many students have been hosted by the Molecular Discovery Lab through a variety of programs, including the NSF-REU Program, Princeton Environmental Institute Internships, CABIOS internships, BIOS UK associates and the Bermuda Student Intern Program. During their internships, students gain practical lab experience in Biochemistry, Molecular and Cell Biology in the unique environment of BIOS. Many undergraduate students have gone on to present their Molecular Discovery Lab research at professional meetings, and to publish as co-authors in scientific journals such as PLOS One, Aquatic Toxicology, Free Radical Biology and Medicine, and FEBS Letters. 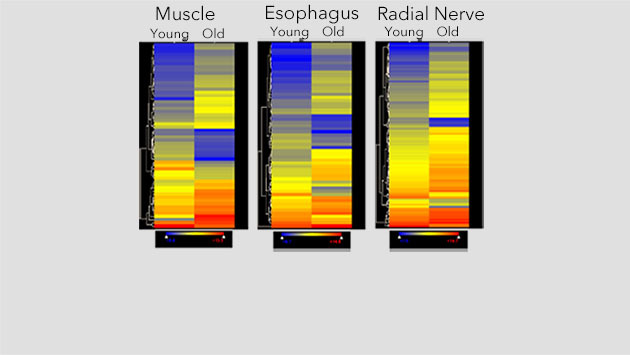 Age-related changes in proteomic profiles of cell-free coelomic fluid from S. purpuratus. 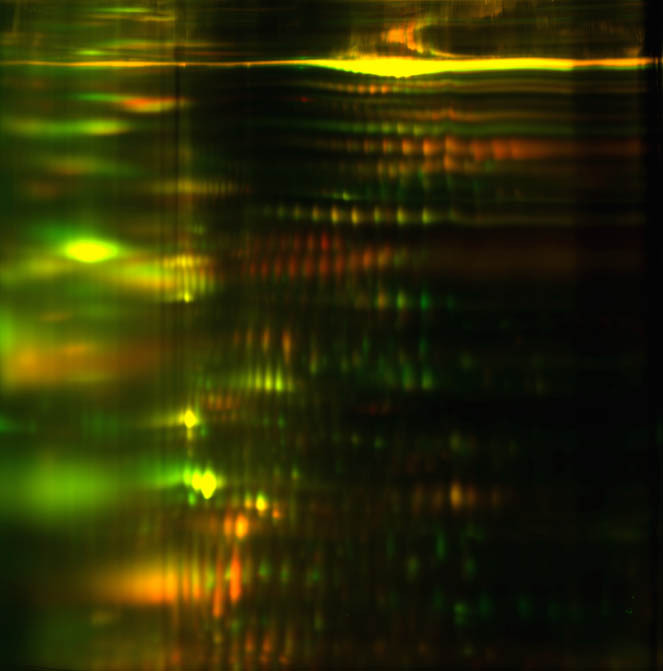 Two-dimensional difference gel electrophoresis showing proteins from young sea urchins labeled with Cy3 (green fluorescence) while those of old sea urchins are labeled with Cy5 (red fluorescence).